This year’s IndyCar championship came right down to the wire. There were multiple drivers in the hunt heading into Sonoma and Josef Newgarden ended up winning the title by just 13 points. Helio Castroneves, who finished fourth in the championship, was less than 50 points behind Newgarden when the checkered flag flew. This was a highly contested championship, and it got me thinking about competitiveness within an IndyCar season. There are definitely seasons where there is a dominant driver and ones where multiple drivers are battling it out all season and everyone is close. To answer this question of competitiveness, I first had to decide how to measure it. I wanted to look at how competitive the top half of the field was in a given year. I chose the top half to eliminate the problem that some seasons had many lower-level drivers with a lot of DNFs, and account for the fact that different seasons ran with different numbers of drivers. This made the process easier and more valid in my opinion. In the future I might look at competitiveness across the entire field if I come up with a good way to deal with the differing number of drivers and the DNF problem. Looking at the top ten competitiveness gives us a good idea of how hotly contested the championship is and how the races are likely to turn out — plus, most of the important action throughout races happens in the top ten. Less competitive seasons will see repeat winners and more straightforward races for the most part. Since realistically the entire field does not have a shot at winning the title, looking at the top ten is sufficient for our discussion. I used a measure similar to the one The Stats Zone used to measure competitiveness across soccer leagues in Europe to measure competitiveness in IndyCar. I took the total number of points the champion of that season scored and subtracted from it the number of points the 10th place driver in the championship scored. I took this number and divided it by the total possible points a driver could have scored in that season to account for the different points systems and number of races across seasons. This gives us a ratio from 0 to 1, where 0 would mean a perfectly competitive season (all drivers score the same number of points) and 1 would mean a perfectly non-competitive season (there is one driver winning every point in every race and other drivers aren’t competing). Obviously both of these scenarios are basically impossible, but they represent the extremes and what we mean by perfectly competitive and perfectly non-competitive. By competitiveness ratio, 2015 was the most competitive IndyCar season. In this season, Scott Dixon and Juan Pablo Montoya ended up tied for the points title after Sonoma, and the former won it on the tiebreaker. Three drivers were within 100 points of Dixon and it was a hard fought championship until the end. The ’13 and ’12 seasons fall in spots two and three in competitiveness. 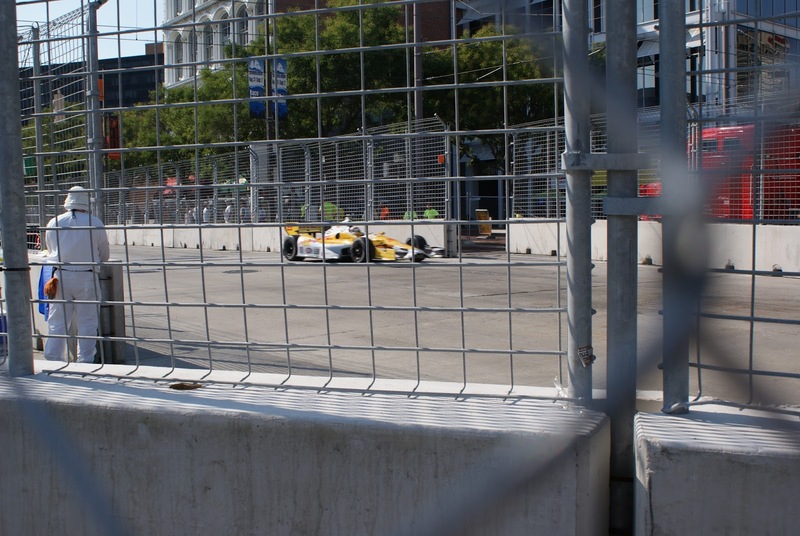 These years saw four and five drivers respectively finish within 100 points of the champion, and ’12 was won by just three points by Ryan Hunter-Reay. The least competitive IndyCar season was 2001 when Sam Hornish Jr. won the championship by over 100 points, finishing on the podium ten times in the 13 race season. 2002 was also an interesting year: while Helio Castoneves was only 20 points behind Hornish Jr., who won the championship again, the rest of the top ten dropped off quickly after that, giving the season a competitiveness ratio of 0.32. Looking at competitiveness ratio by season, we can see an interesting trend. Right around 2012 there was a drop off and the series has been more competitive since. This could be because of the introduction of the Dallara IR-12 chassis at the start of the 2012 season. The new chassis might be have leveled out the competition more and be the reason for the drop off we see. Aero kits were introduced in 2015, but there wasn’t much of a change from the two years prior in terms of competitiveness. It’ll be interesting to see how the universal aero kits being introduced for the 2018 season will change the competitiveness of the series. Competitiveness in IndyCar is an interesting topic and I’d definitely like to explore it more in the future. Finding a way to incorporate full field competitiveness is a goal of mine and I’ll be posting more about the subject in the future. Read part two of this series on competitiveness in IndyCar here. Updated 11/17: Fixed an error in allocating bonus points for certain seasons. 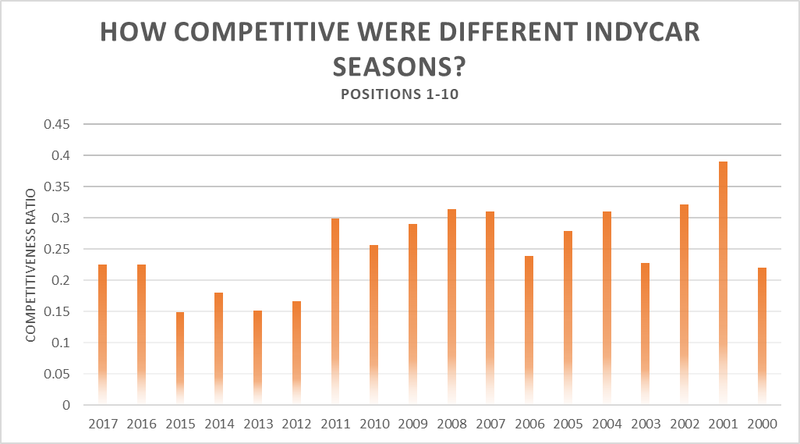 The least competitive season is now 2001 instead of 2008. The chart and article have been updated with the small change. This is a great idea! The formula you created (I'll call it 'Points Gap/Max')is a great way to measure competitiveness in the points standings. I'm not as generous as you in defining who has a shot at the championship. I'd say 5 or 6 is the maximum for recent years (basically, count the number of Penske and Ganassi cars). Would Points Gap/Max for the top-5 and top-3 championship finishers tell a different story? Great work with this! Thanks for sharing. I enjoy new ways to analyze IndyCar. Thanks for your comment, Kyle! The summing idea you mentioned is actually a really interesting idea. If you summed up those ratios for each driver and then took the average, I think that'd be a good measure of average competitiveness within a given range. Right now I'm basically looking at how competitive the field is based on the gap from first to x place, but by summing the differences and averaging I could get average competitiveness across the field. I really like that and I think it'd be a better measure (more work to compute, yes, but definitely stronger in the end). This would help account for how competitive each individual driver was to the champion, not just the field. And you're right, I might be a little generous in my top-10 assumption. I'd be happy to break it down by top-5 and top-3 to see how those graphs compare when I have some time and post them here! Thanks for you comment, Kyle. I loved reading your work on Slipstream! When I get around to trying out your summing ratio method, I'll post the results here!